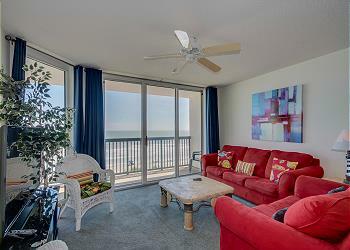 Ashworth resort is located in the high desired area of Ocean Drive in North Myrtle Beach. Every vacation condominium at Ashworth features an oceanfront balcony so your family’s beach vacation begins with oceanfront views of our beautiful white, sandy beaches. Ashworth resort located at 102 North Ocean Boulevard is an 18-story tower in the attractive Ocean Drive section along the North Myrtle Beach oceanfront with all the comforts of home. Ashworth’s family-friendly recreational amenities include a pool deck with an oceanfront lazy river, oceanfront swimming pool, oceanfront kiddie pool & oceanfront hot tub. Convenient parking in the multi-level parking garage at Ashworth makes parking a breeze. The Atlantic Ocean is just steps and invites you to rest and relax during your North Myrtle Beach vacation stay at the Ashworth. There is an on-site fitness center, indoor swimming pool and easy beach access will contribute to making your family vacation at the oceanfront Ashworth unforgettable. One thing that also makes this resort special is the oceanfront grassy area. If you don’t like the sand between your toes, try soft grass in the shade lying under the palm trees. North Myrtle Beach rewards you with oceanfront beach views, ocean breezes and delicious, local seafood. Family vacations in North Myrtle Beach mean oceanfront play time and smiles all around. This luxurious accommodation is located along Ocean Boulevard where beach clubs, boutique shops and beachfront fun are easily found. Free wireless internet access is a bonus for those who cannot bear to be without the Internet.